Jak and Daxter might be the odd middle child between Crash Bandicoot and Uncharted, but Sony hasn’t forgotten about Naughty Dog’s PlayStation 2 series. The first title, The Precursor Legacy, was released on the PlayStation 4 earlier this year—per the PlayStation Blog, the remaining three main titles will soon follow suit. Jak 2, Jak 3 and Jak X Combat Racing will join the PS4 library, all receiving a 1080p facelift. Jak 2, which originally released in October 2003, two years after the first game, was a significant departure for the series, taking it into a darker place tonally and giving silent protagonist Jak a voice. Jak 3 and vehicular combat game Jak X soon followed. The series has since been put to rest, with Naughty Dog moving on to Uncharted and The Last of Us. Appearing in PlayStation Move Heroes and PlayStation All-Stars Battle Royale, the characters themselves are still alive and well. 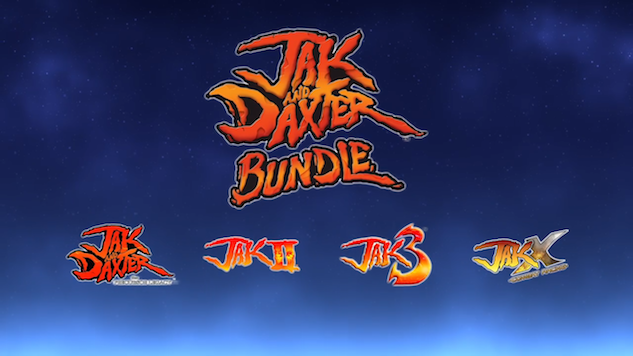 Catch up with Jak and Daxter when the last three games are released on Dec. 6. No pricing has been confirmed by Sony as of yet, but the first game costs $14.99 as a reference. Check out a trailer for the bundle below.